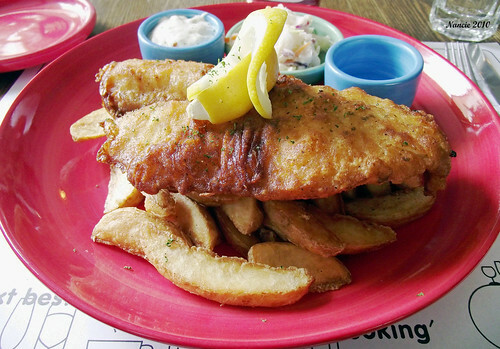 One of the comfort foods that I crave from home is fish and chips. Growing up in Nova Scotia the fish is always fresh and finding a good “feed” made with fresh haddock along with home cut fries is never difficult. Fast forward to Korea and it’s a different story. Most western restaurants here are overpriced and mediocre at best. One that stands out in the crowd is Suji’s located in Itaewan, the foreigners section of Seoul. Last Friday I had some errands to run in Seoul, and then I decided to pop into Suji’s to satisfy my hankering for some good fish and chips. I was not disappointed. The fish was lightly battered and fried to perfection. No knife required. The fish flaked away with a fork. Add the home cut French fries, tarter sauce, fresh cole slaw (I want the recipe), and malt vinegar, and it was a lunch made in heaven. At $16.00 a plate, the price was within reason. My one complaint is their beverage prices. I don’t think there was anything on their beverage list under $5.00. I stuck with water, which probably is the healthiest choice. Suji’s is located in Itaewan just around the corner from the main drag (closest to the arches). This photo is imported from Flickr. If you want to see a larger size, just click on the image. Any comments, tweet, stumbles, etc. most appreciated. Previous Post: « Through the Sandbox Lens #6 — Rural Korea. Fish and chips is comfort food for me too. We don't get to enjoy it very often though. We have a few restaurants in Taipei that sell miniature fish cakes, but they don't even come close to looking like this. Fish and chips in Korea – I never would have thought! Last time I was there I tried to get a grilled chicken sandwich, and I got a really breaded chicken thing with cheese (I think it was cheese), and some sort of mashed potato on top with mustard. Fish and chips are certainly comfort food for me too – made from Atlantic cod in or halibut in PEI… Yum. It just can't be beat! oh yum, this looks soooo good. i LOVE fish and chips! I can relate to your grilled chicken sandwich experience. You just have to be really picky about where you go for western food in Korea. Taipei doesn't strike me as a F & C kind of place. That looks fabulous. If you get the recipe for the coleslaw please pass it on. You’re welcome. I’m heading back to Korea tomorrow and will drop in sometime soon for more!